Will be talking about all things fluffy, furry and finned today with our favorite veterinarian Dr. Phyllis Neumann today on HearSay. Call during the show or send us your questions in advance through Facebook or hearsay@whrv.org. Six candidates are facing off in the Republican primary on June 8th. Today we'll bring you interviews with all six candidates. If you live in the 2nd District, which includes all of Accomack and Northampton Counties as well as the City of Virginia Beach and parts of the cities of Norfolk and Hampton, or are a political junkie you'll want to be sure to tune in. What's Cookin' Wednesday - Grill, Baby, Grill! Memorial Day is coming up this weekend and with it comes the un-official start of summer. When we think about summer foods we think about firing up the grill, ok we also think of ice cream, but for today we're focusing on the grill. Our resident foodie Patrick Evans-Hylton joins us along with Lee Ann Whippen of Wood Chick's BBQ and Chef Sam McGann of River Stone Chophouse. They'll have tips and tricks that will make your grilled summer meals come off without a hitch. I love all sorts of cornbread: sweet cornbread, white cornbread, cracklin’ cornbread – it is one cakey sidekick to a myriad of dishes, or enjoyed on its own. Raised by my paternal grandmother in suburban Atlanta, we had cornbread at least five times a week; it was great to dunk in hearty Brunswick stew, or eat along side an all-vegetable supper of collards, lima beans and stewed tomatoes. Cornbread is also the perfect foil for a big plate of pulled pork barbecue, slaw and baked beans. Prepare traditional muffin tins by coating lightly with a cooking spray, or set a silicone muffin tin aside. Preheat oven to 400F. In a medium bowl, whisk eggs; combine with the wet ingredients of sour cream, butter and milk. Stir to incorporate. In a large bowl, combine the dry ingredients of flour, cornmeal, baking powder, baking soda, salt, thyme and sugar; stir to incorporate and make a well in the center of the mixture. Pour wet ingredients into the well of the dry ingredients and gently fold to mix; stir until just blended. Spoon batter into muffin tins about 2/3 of the way full. Bake for about 25 minutes, or until the tops are lightly browned. Check the doneness by inserting a toothpick in the center of one of the muffins; it should come out clean. Just before the muffins are done, add a small amount of honey in a saucepan and heat. Lightly brush the tops of each muffin right out of the oven and still hot, with a little of the honey; the heated muffins will absorb some of the honey. Yields 8-12 regular-sized muffins. Summer doesn't officially start for almost a month, but we've already had some warm weather in Hampton Roads. Today we'll talk with our gardening guru Jim Orband about the tasks you should be tackling in your yard. We'll also check in with Kathy Van Mullekom of The Daily Press to get the latest on garden related happenings in Hampton Roads. Today we'll talk about the stories making headlines across Hampton Roads and the nation. They include the effort to recall Portsmouth Mayor James Holley, the discovery of $11 million in transportation funds available for use in Hampton Roads, and more. Join us for the discussion at 440.2665 or 1.800.940.2240! Peace Talks Radio considers two men – Greg Mortenson and Dr. Mohammad Khan Kharoti - who firmly believe that the path to relieving suffering, reducing conflict, and promoting peace in the troubled and chronically war-torn country of Afghanistan is by building schools. These schools would serve young Afghan boys and especially young Afghan girls, for whom education and basic literacy has been denied. We hope you've been reading Amy Tan's The Joy Luck Club along with us. We'll discuss the book with the author of the CliffsNotes for the book, Dr. Laurie Rozakis and Dr. Kaa Hinton-Johnson, Assistant Professor at Old Dominion University which is hosting an ongoing Big Read initiative surrounding the book. In February of this year Cathy spoke with Professor Jeff Littlejohn and Portsmouth sit-in leader Ed Rodman as we marked the 50th Anniversary of Civil Rights sit-ins held across the country and in the Tidewater area. You'll want to be sure to tune in for a chance to hear this wonderful conversation. The Brookings Institution released a report on the State of Metropolitan America last week. The Hampton Roads region, the nation's 35th largest metro area, was noted as having a slow growing, aging population with less education and diversity than the national average. We'll talk about the implications of the studies and the ways changing demographics are impacting the region. Guests: Alan Berube, Senior Fellow and Research Director of the Brookings Institution's Metropolitan Policy Program, Mike Gruss, lifestyle columnist for The Virginian-Pilot and John Skirven, CEO of Senior Services of Southeastern Virginia. 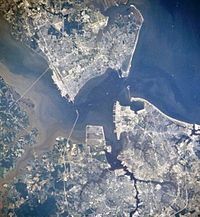 Last week the Chesapeake Bay Foundation (CBF), along with its co-plaintiffs, settled a lawsuit against the Environmental Protection Agency (EPA) and the agreement amounts to a new way ahead when it comes to Bay cleanup. We'll talk with local CBF Director Christy Everett about what the implications of the settlement and the Obama administration's newly announced plans for restoring the Bay. We'll also talk about the latest on the potential carrier move - a new Government Accountability Office report notes a "lack of completeness" in the Navy documents regarding the move. Join us!